Martin Allen barks out instructions during the game with Fylde. Martin Allen believes his side deserve recognition for two passion-filled performances on the trot. 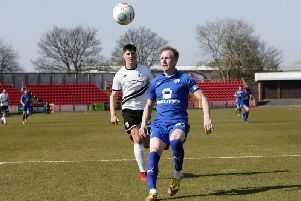 Chesterfield followed up last week's point at Maidenhead with a goalless draw with AFC Fylde today at the Proact. Read the report here. Town remain without a win in 12 outings but he couldn't fault his players' effort. "I think we all - the media, the supporters, the staff, the players - we all need to recognise it's two games when they have been fully committed, 100 per cent effort, playing with pride and passion," he said. "There's been a lot of effort behind the scenes because it hasn't been good to watch. "We've all put in a lot more hours and thought, worked out ways we need to improve. "We'll just take one step at a time without talking about must-win this or that." While he was a little disappointed not to get all three points, he felt it was an improved display. "I thought it was a much better performance. "The supporters I think showed their appreciation at the end. "It was a game of two halves with the wind, it was very, very strong. "We weathered their storm in the second half. "Most importantly we got a clean sheet. "I suppose it's a good point. "There's always an element of disappointment when you don't win at home. "It was a sold, hard working, grafting team performance. "I think every member of our team was 100 per cent committed and played with passion, which is what fans want." One thing that evidently did not please the Spireites boss was the performance of referee Joe Hull, who failed to spot what the home side felt were repeated blatant fouls on Tom Denton, a number of which took place in the penalty area. "I didn't know it was okay to grab people around the whole body and pull them down, I didn't know that was acceptable," he said. "I will write a report after I've seen all the clips on Monday morning. "I think it's very important I don't criticise and go public with how I really feel. "I think it best I do the decent thing and do it correctly on Monday morning. "We have to respect their decisions but I think today the referee got a lot of them wrong."